including signal transduction, biosynthesis, protein repair, gene silencing and chromatin regulation. abnormalities, including Alzheimer’s, depression, Parkinson’s, multiple sclerosis, liver failure and cancer. 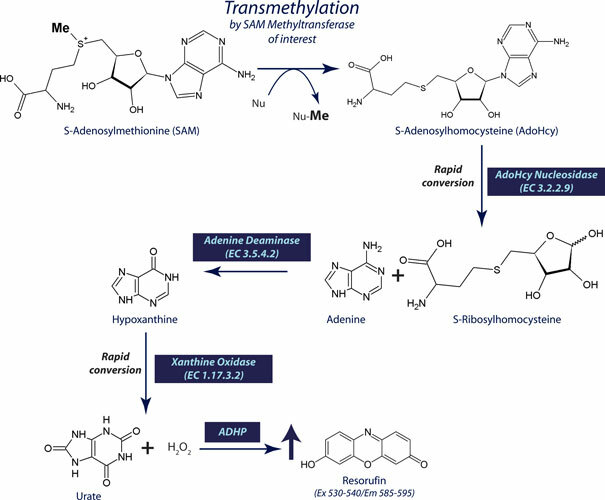 histone methyltransferase Set7/9 is assayed with 20μM TAF-10 as the acceptor substrate. A colorimetric SAM methyltransferase assay are also available. wavelength of 530-540nm and an emission wavelength of 585-595nm. • Kinetic analysis of purified methyltransferases or screening methylation inhibitors. • Continuous enzyme coupled assay for kinetic studies. • Fluorescent, non radioactive assay. • Supplied with all reagents, including positive control. • Adaptable for enzymes that generate S-adenosylhomocysteine or 5'-methylthioadenosine. • For the kinetic analysis of protein SAM methyltransferase enzymes. • Ideal for screening of methyltransferase inhibitors.